Day VII: What a long day of adventuring! Woke up early — too early, considering last night’s outing. How do the Greeks do it? They stay up late and wake up early. They say the solution is to siesta all afternoon (and there’s definitely not much work activity visible after noon), but that still seems tough on the sleep cycle. The first excursion on the day’s agenda was a trip to Monemvassia, an ancient city built by the Byzantines (with architectural help from the Turks and the Venetians) that still functions as a living town. Well, the lower half is still functioning — the top half is one giant set of ruins. It’s built on a tall hill surrounded by the sea, connected to the mainland by a tiny causeway. From a defensive perspective, it was ideal (until someone figured out that they didn’t have enough food resources and starved them out). 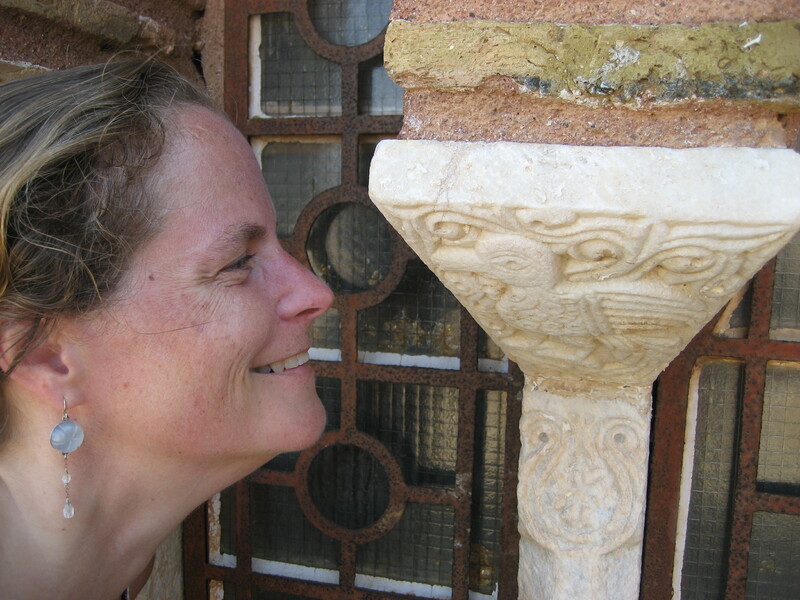 In a feeble attempt to beat the heat, when we arrived on the Rock (as Rick Steves calls it), we skipped the inhabited, slightly touristy main street of the Lower Town and went straight up to the ruins of the Upper Town. This was a hot and dry space – it was easy to see how a siege might’ve been effective many years ago – but there were so many half-standing buildings that you could actually picture what a medieval fortress city might have felt like. We walked up to the old citadel, all around old homes, and over to the church. 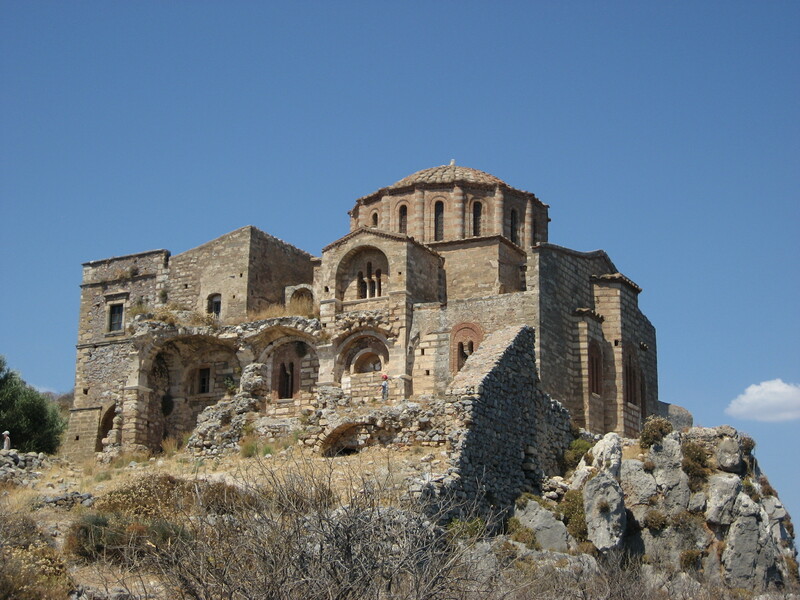 As at Mystras, there’s a surprising lack of “don’t go here, you’ll fall in a hole” signs (which, given the prevalence of old cisterns, might actually be warranted). 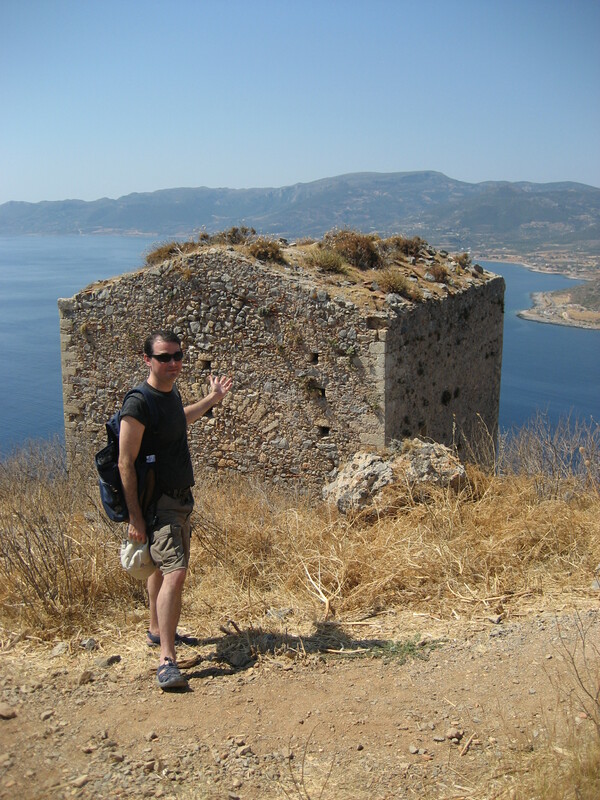 Monemvasia has a famous late Byzantine church that’s perched precariously on a cliff’s edge– so precariously, in fact, that it’s now closed (due generically to “danger,” the sign informed us). I was sorry to miss this one, but Prescott was glad not to be dragged into another church. We returned to the Lower Town and walked the residential streets for a few minutes. Sometimes it was hard to tell what was a street and what was a backyard ,and the doors all seem to be made for people under five feet tall. 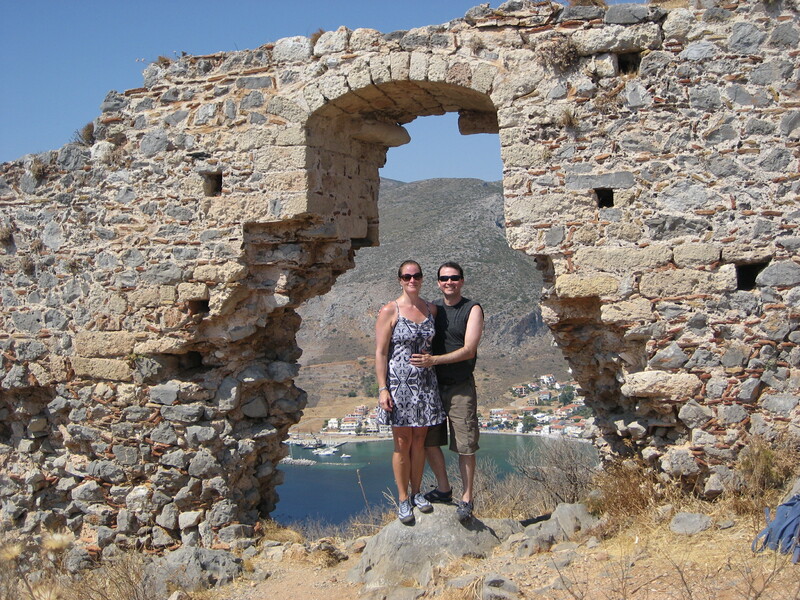 We also couldn’t figure out how people get things like couches and refrigerators into Monemvasia, since there’s only one entrance gate, the streets are really narrow, and there are no cars (our best guess is that large things come in by a sea gate, but we never had that confirmed. For lunch, we were served our first mediocre Greek salad (how did they find bad tomatoes here?) and superb grilled mullet (boy, but some of the tastiest fish I think I’ve had). Then, after a quick honey-shopping stop, we went on to our next adventure: a trip to the island of Elafonissis. 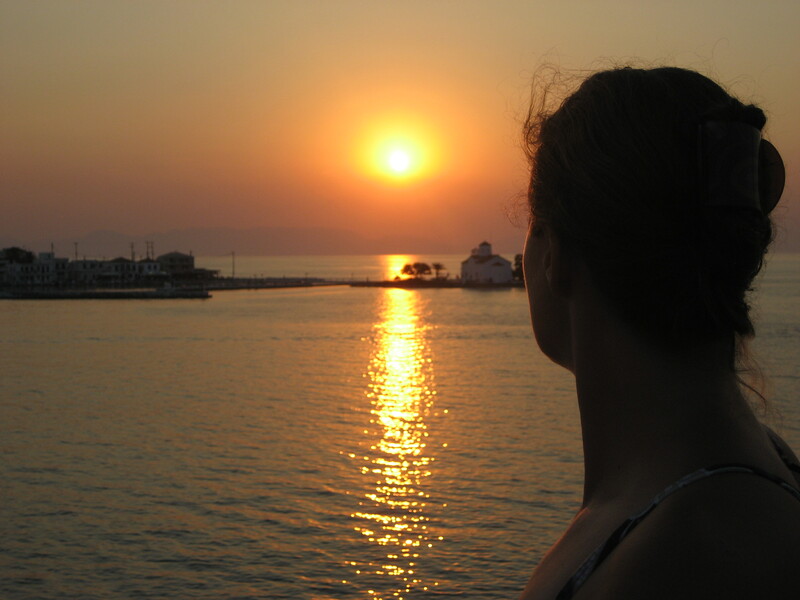 We went to Elafonissos for two reasons: (1) it’s a Greek island that you can get to in under 10 minutes and relatively cheaply and (2) it’s rumored to have the most beautiful beach in the world. 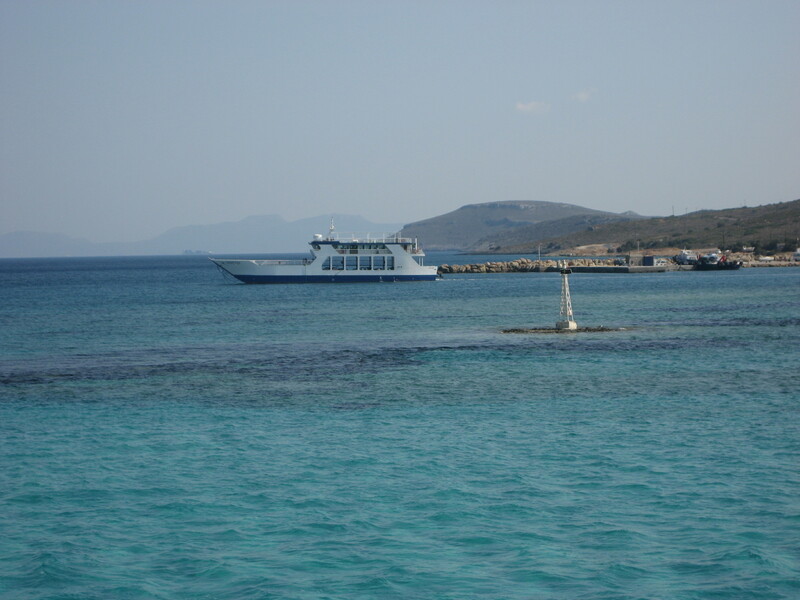 The ferry ride was quick and easy – Elafonissos is two kilometers from the mainland. And you can see to the bottom of the ocean for the entire, very shallow ride. 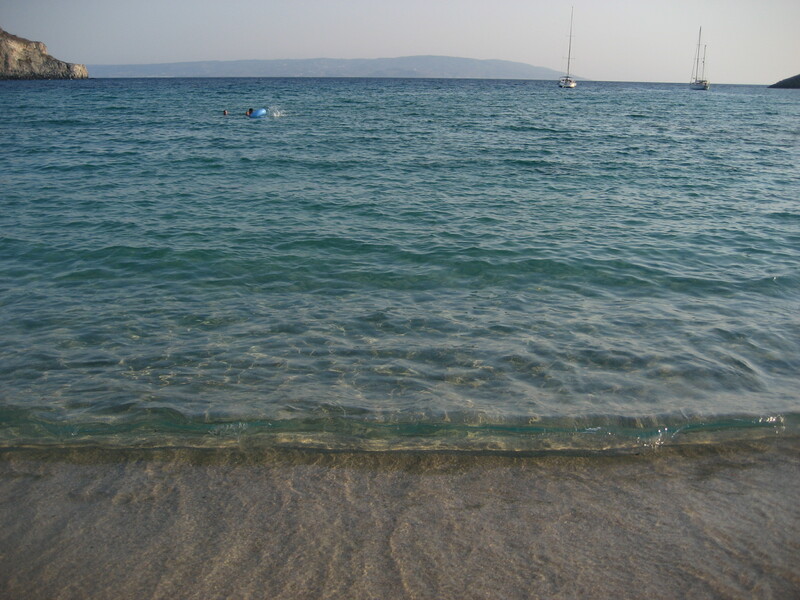 The beach, Simos, didn’t impress me at first (was it beautiful? Yes. But the most beautiful beach in the world? That was harder to buy). Then we went swimming – and it was incredible. Sand softer than any I think I’ve ever felt in my life; water clear as a bell and pure turquoise blue; and nothing at all on the ocean bottom. With goggles on, you’d swim and see nothing but empty sand and aqua sea before you. It was like a swimming scene out of a movie (one that I was not able to capture well on camera, sadly). We stayed at the beach for a couple of hours and then decided to head back, so that not all of our long drive home would be in the dark. Our ferry ride back to the mainland had another postcard moment: the sun setting over the little island’s main town, with the sea and mountains in the background. We stopped for dinner in Vlachiotis, a town chosen randomly by timing and the positioning of its central square relative to the main road. We had an excellent pizza and salad. A long day – we didn’t get home till nearly midnight – but definitely interesting.